Something the Old RunningFox said about one of my earlier posts has got me thinking. I’d commented that I was using a combination of gels, dextrose tablets and isotonic drinks to fuel my long runs and he said, quite rightly, what would Ron Hill have made of that? In his day just a sip of water was enough to see him through a half marathon or even further. Quite true, I’m sure, and if I could run a half marathon in a hour or so I wouldn’t need all this extra fuel. But I can’t. Yet! I’ve always gone by the rule that for runs up to 30 minutes I don’t need anything. Just a drink of water before I start and a drink of water when I’ve finished. Between 30 minutes and an hour, I carry water and sip it as I need it. Nothing more. Anything over an hour I take an isotonic sports drink with me and anything over two hours I take a gel half way round. I think that’s pretty standard thinking, although I’d be glad to hear if you think differently. When I first started upping my distance I relied purely on water and jelly beans, not even fancy sport ones, just plain old jelly beans. Apart from the fact that they tend to merge into one huge jelly bean the longer I’m running, I’d probably be more inclined to take beans with me rather than gels or dextrose. What I’d really like to do though, is investigate some better, more natural, less scientific and ultimately cheaper ways of fuelling long runs. I bought a bag of jelly beans the other day, purely for research purposes you understand. 100g (half the bag) contains 370 kcal, 0.3 g protein, 91.3g carbs (of which 52.9g are sugars), 0.1g fat (saturated), 0.1g fibre and not much else. In comparison the Dextrose tablets contain 1535 kcal, 0g protein, 88g carbs (79g sugars) and 0.3g fat per 100g. Not much difference energy wise. Costwise my bag of beans cost 89p for a 200g bag. A packet of 12 Dextro tablets cost 75p. Dextro Energy suggest popping a 3.4g tablet every 15 – 20 minutes. An equivalent amount of beans (approximately 12) would see me having to carry and consume, on a two hour run, almost 100 beans to every 8 tablets. I think I would be sick. I have no choice now but to eat my jelly beans to help fuel my search. Yum. The other issue, for me, is that a lot of sports fuel have nuts or gelatine in then and I can’t/won’t eat those. I hunted high and low and read the small print on many, many gels before settling on the MaxiFuel Viper Active ones. I took one at 7 miles on a half marathon distance run. Their spiel says to take 1 – 2 every hour of exercise, which would really mean me having to take four of them. I tried the SIS gels on the Great North Run, opting to take three spaced out over 4, 7 and 11 miles as they suggested three per hour! Beforehand I thought this was excessive, but my Garmin data showed a definite boost about 10 – 15 minutes after consumption. The SIS gels are labelled as vegan. The MaxiFuel ones I will have checked as vegetarian, at least. On the run I find all gels difficult to open though; sweaty hands and wee rip off tops just don’t mix. The problem is that gels and tablets tend to be more energy efficient per gram than anything else. That’s what they’re designed to be. So can I find something else, as compact and as nutritious? Ahh, this is them then, the post big race blues. I’ve not experienced this feeling before, having only done small races with very little hype. I find myself in the biggest set of doldrums I’ve been in for a very long time, not quite knowing how to get out. 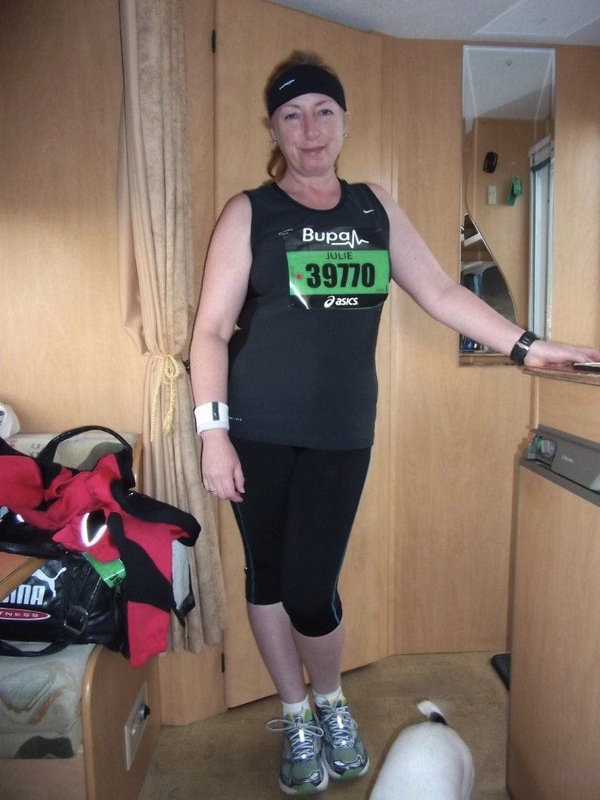 I was so full of emotion after the Great North Run that I didn’t quite know how to express it. Some of it came out as anger against the crowds that caused my husband to miss my finish and kept me waiting for him for over an hour after the race. Some of it was despondency – how can I put myself through that again. And some of it was just delight at having been there at the largest ever biggest half marathon in the world. The race itself, the joy that was the race, was getting lost beneath all these all negative emotions and I had to step back and deal with that. I found myself sending ranting tweets to celebrities who dared to tweet how wonderfully organised the event was. I was pretty wound up at the way I was left feeling after the race but, apart from the people who called for the buses to be emptied too early, I have no beef with the event organisers. Everything else was caused by the sheer volume of people attending. And the only way they can deal with that is to further cap entries. I enjoyed running with Murphy on Tuesday, totally naked of technology and just running as I wanted. Slowly and without breaking into a sweat was what I needed. Today it’s very wet and the light isn’t good. I won’t chance running on the road or running through the woods – I will be hopping onto the treadmill and making the best of a rotten day. I am now looking at what to do next. I’ve promised that I will do the Rock and Roll Half Marathon in Edinburgh next April. I think I will make that my big event of the year. 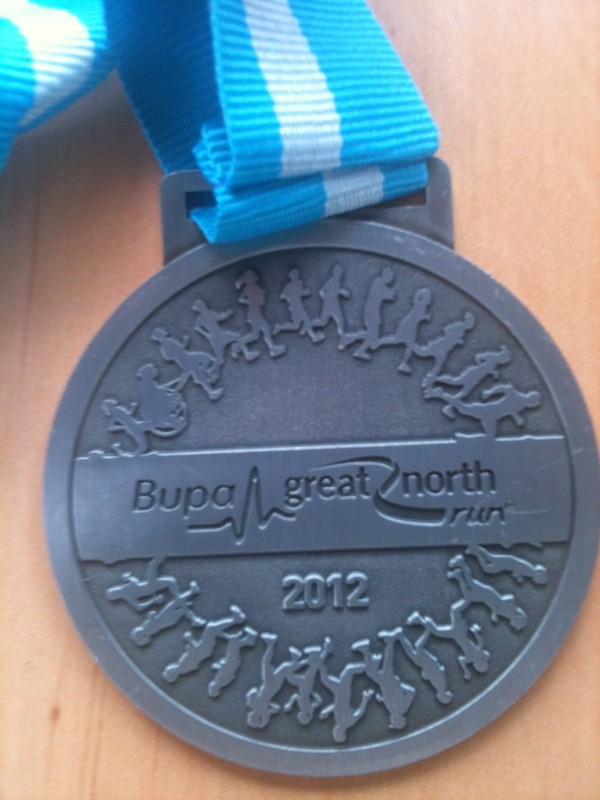 I can always put my name down for the GNR 2013 ballot and let fate decide if I am to do the event next September. In the meantime there is the Jedburgh Running Festival at the end of October and I have a choice of a 10k and a half marathon there. There are some other options available, I just need to work round the rest of my life. And stop stressing. Life is too short for stressing. I wrote the title carefully, adding 2012 afterwards in case I needed to identify it as the 2012 report in the future. I’m trying hard now to remember as many details as I can for you, but also for me because the whole day blurred into an experience, rather than a race. 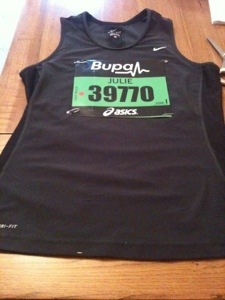 The Great North Run compares with nothing I’ve ever done before. If I’m honest, I’m sitting here watching the race on TV, which my son recorded for me. If nothing else it’s sparking memories that might make this a better post. I’ll start at the beginning, at 7am when my alarm woke me. I was already awake, of course, waiting for the alarm to sound. I’d slept well and knew that I had everything ready so that I could breakfast, dress and go. I followed advice and ditched my porridge for toast and jam. We’d decided to catch the Metro from Whitley Bay. It’s the furthest point from Newcastle no matter which way you go so chances were that it would be quietest so far as passengers go. We also knew that it had a reasonable car park. Right enough the car park was only half full when we go there at just after 8. There were around 30 other runners at the station waiting. We boarded the anti-clockwise train and easily got a seat. So far, so good. Runners embarked at every stop, until there was standing room only. We soon reached Haymarket, the station identified as the closest to the start, and followed the crowds. We had no idea where we were going; our recky run the day before hadn’t taken us further than the station. We passed the university and on the other side of the campus found ourselves in crowds I’ve never seen the like of, despite being a city born girl. Murphy had to be carried for fear of him being trodden on. We found the baggage buses, all thirty of them, lined up parallel to the start. The green starters buses were right at the back so it was some walk to the bus and back. Once I’d deposited my bag I thought it best to visit the loo. It was now 9:45 and we were to be in our starting pens by 10:30 at the latest. No bother then. What I hadn’t anticipated was how long it takes for people to pee. We joined a queue thinking it was one queue for the entire toilet block. It turned out to be the queue for the last toilet in the block and as we reached the corner we could see smaller queues for the others. Time wasted there! It was now 10:00. I eventually reached the end of the toilet queue at 10:15. Grant was panicking that I’d miss my pen time. So was I. We went straight down to the start. The race starts on the A167 motorway, using both sides of the motorway. As we walked we went further and further from the starting line, trying to find my section. Eventually we found the green section, but no way into it. It turned out that the sections were merging and there was no clearly identifiable ‘I’ section within the green. I kissed Grant and Murphy goodbye and I queued up with hundreds of others outside of the pens, trying to move into them. Grant and Murphy planned to catch the Metro across to South Shields in time to see me cross the finish line some two and half hours later. As we waited the gun fired and the pens started to move forward, very slowly. It was obvious that as the people already in the pens moved forward we’d not be able to edge into our section. I couldn’t take it and jumped the fence along with a few others. I wasn’t going to be left behind, sorry! It was way after 11 when I crossed the line. I had stuck to the right hand side of the road with the thought in my head that I needed to stay out of people’s way when I was on a walk break. When I looked across there was Mo Farah high fiving the starters on the left. Damn. An opportunity missed. I wasn’t about to race across the road for a taste of fame though. Whilst we were waiting for the start it had started to rain quite heavily. I managed to grab an Asics raincoat that someone had stuffed in the fence and wore that until we got close to the start. The rain had slowed by then and was reduced to a gentle and refreshing shower. I had Jeff Galloway and his wonderful half marathon app on my iPhone, giving me a consistent pace to run to and I set off steadily, as planned. To begin with I was running with plenty of space around me. I didn’t take a lot of notice of people around me so I can’t say if they left me behind, or if I left them, but what I do remember is that just up from the start was a row of trees and a set of toilets; I couldn’t believe how many men headed for the trees and women headed for the loos! We ran along the motorway into Newcastle centre. As we went through the first tunnel there were shouts of “Oggy, Oggy, Oggy!” Spectators were lining the bridges and streets, which was amazing to see. I don’t think I’ve ever run for so far smiling! I won’t do a step by step analysis of the run. To begin with I was running around about a 10 min/mile pace. Mile 1 came in at 9:34, mile 2 at 9:55 and mile 3 at 10:08, giving me an official 5k split of 31:01. I was really happy to see that. There was a time, not so long ago, when I couldn’t crack the 30 minute 5k and now I’m not far off that whilst carrying on to run a half marathon! Crossing the iconic Tyne Bridge was the next amazing point. My husband loves bridges and I thought about how much he would like this as I crossed it. The amount of charity runners out there was astonishing. Thousands and thousands of them, for more charities than I knew existed. 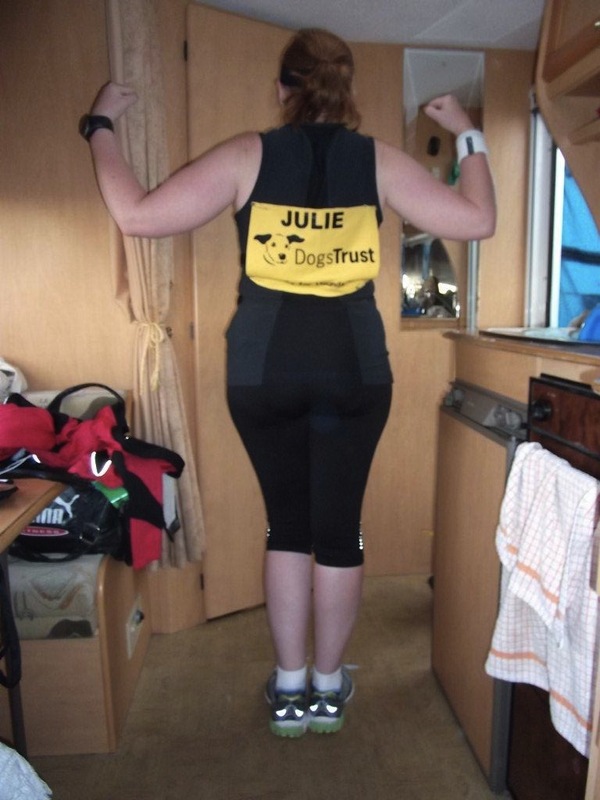 I spotted three other Dogs Trust runners on the way round and got a couple of pats on the back from other runners acknowledging what a great charity Dogs Trust is. As well as spectators there were bands playing, the local radio station had presenters positioned along the course and ordinary folk were there handing out sweeties, oranges, ice pops – even Jaffa Cakes! It was hugely motivating, hugely so. I think the crowds, more than anything, spurred me on. There were frustrating times when we were running on narrower roads and I was dodging people trying to overtake them, weaving in and out and feeling as if I was running an extra mile on top of the 13.1! I reached 10k in 64:52 which isn’t far off my ordinary 10k time. It’s certainly faster than I could do 10k last year! I’d been under the misapprehension that the course would be fairly flat, heading gently down to the coast. How wrong I was. It seemed to be hill after hill after hill. It shows on my Garmin data that the uphill miles 4 and 5 were much slower at 10:47 and 11:07. I managed to pick up my pace on the next two miles (10:14 and 10:35) and the fact that I managed to do so many faster miles meant that I could afford to be a bit slower on some miles and still be under my 11 min/mile target pace. My nutrition was spot on. I had my Lucozade Isotonic drink for all the way round. I didn’t take any water or Powerade offered at the roadside wanting to stick to what I knew worked. I had my gels at miles 4, 7 and 11, although getting the tops off the gels was a nightmare with sweaty fingers! I had to stop and ask a fireman to help me open my last one! Just before the drop down into South Shields there is a hill that just seems to go on forever! People around me were walking, but I was determined to only walk when Jeff told me to. At mile 12 the ground just dropped away in front of us revealing the sea. At last! The last mile was nothing short of a killer. It was a long mile, but I tried to lift my pace. I did the last mile in 10:35, even managing to speed up at the end! The sight of the 800m sign spurred me on. I looked along the spectators for Grant and Murphy, expecting them to be somewhere along the finish straight. The Red Arrows did a fabulous display as I ran along the finish straight, finishing with a huge heart. They’d started us off at Newcastle and were helping us finish at South Shields. I crossed the line in 2:22:13 in 27,766th place. It was a half marathon PB by 2 minutes which, considering the course and the amount of people in my way most of the time, was brilliant. My Garmin data is here. I was spent by the time I crossed the line, I have to admit. I struggled to walk from the finish line to the chip deposit section. I managed to stretch out just beyond this and went to collect my goodie bag, complete with T-shirt and medal. The organisation at this point was spot on. Beyond the finish was a section for families to reunite. I rang Grant to tell him that I was heading up to the section for H and would wait under the flag, but only got his voicemail. Unbeknownst to me Grant had been held up in Newcastle, struggling to get a train to the coast. I waited and waited, getting colder and colder, not wanting to move in case I missed Grant. There was nothing in my goody bag that I could eat, everything had nuts or wheat in. All I had was the Powerade to sip. An hour passed and still there was no sign of Grant. I kept trying to call, but my calls just went to voicemail. I sent texts to say where I was and eventually I got a reply. For some reason he had not received any of my voicemails and only knew that I’d finished when he started to get texts. When we finally found each other I needed my kitbag and the milk shakes and Mars Bar. We headed for the baggage buses. I couldn’t find my bus! There was the sign saying bus 23, but no bus! When I asked an official he said the buses were being unloaded, despite the fact that the buses couldn’t leave and there were people still running! I was sent to a small marquee, loaded with bags, with a massive crowd leading from it. I joined the throng and patiently waited. There was no queue. It was a bit like a jumble sale. It was a good twenty minutes before I got to the front, a full two hours after I’d finished. Had I realised that Grant was so severely delayed I’d have gone straight to the baggage bus. I had something to eat and drink, although there wasn’t anything other than chips for me on the stalls. Sadly the risotto had run out! I settled for some hastily and undercooked chips and a hot chocolate. We walked into South Shields town centre, following many others along the route, reaching the end of the Metro queue far too quickly. It stretched for the length of the High Street. I was tired and hungry. I wasn’t relishing the wait. We had initially planned to take the ferry across to North Shields and then two stops on the Metro to Whitley Bay. If I had been alone I think I would have chanced it and headed for the ferry, but together we are useless decision makers, neither wanting to upset the other! Instead we waited in the queue for a good hour or so. By the time we reached the platform I was shot. I started to feel sick and went to sit down. The train was fully packed and all the seats were taken before we could get on. I was carrying Murphy so I had no hands free to hold onto the straps or poles. Almost immediately I started to feel ill. My temperature started to climb and I felt weak. Apparently the colour drained from my face and I eventually took Grant’s advice to sit down on the floor. I sat on my bag with Murphy on my lap for the remainder of the journey into Newcastle, only really feeling better when we’d changed trains and reached Whitley Bay and I had my curry and Guinness in my hand! People have been asking if I’ll do it next year and I’m still unsure. If I could be transported to the start and beamed home at the finish I’d say yes, like a shot. Getting there wasn’t too bad, but getting away was awful. Everyone, especially catered for elites and celebrities, has been tweeting about how wonderful the event was and, yes, it is a great race. I loved running it. The logistics of getting away spoilt it for me. What I’ve learnt is that I need to go through the finish and head for my bag. Forget meeting anyone – just go. After that I can relax, knowing that I have my food and drink. Then we need to look more closely at the ferry and how much easier that might be or for Grant to take the car straight to the finish and park up there. Today I went for a recovery run. Just a slow trail run with Murphy, free of iPhone, music and Garmin. I walked when I wanted and ran when I wanted, working out the stiffness in my legs. It was bloody hard for the first half a mile, almost as if my feet had forgotten what “to run” meant! After that I just went with my easy pace and enjoyed it, hardly breaking sweat. Next on the calendar? I’m not sure at the moment. Give me a few days and I’ll let you know! Just sat down to write this pre-GNR blog post, when the Red Arrows flew past the caravan. That sort of sums up our day; a mixture of the sublime and the ridiculous. We caught the Metro train into the city this morning, rehearsing tomorrow’s route to the start. It seems easy enough without fifty odd thousand other people trying to do the same! We made our way down from Haymarket to the Quayside, only to be greeted by a sea of people. Everyone and their granny had come down to see The GNR Games and celebrity spot. We’d planned to meet friends at the Pitcher and Piano, which was mobbed. I’m not quite sure how I managed it, but I spotted Zoë’s mum, Joan, sitting outside having only ever seen her in a Facebook photograph! Prior to today I’d met none of my Facebook running friends in person. Ours was a virtual relationship and I said to Zoë when she arrived that it was like online dating! It was far too busy for us, with Murphy, to venture across the Millenium Bridge so our viewing was restricted to watching the large screen across the river, although I did mosey on down to the end of the bridge to watch Mo Farah racing. I took a couple of photos, one blurry one of Mo in the distance and an excellent one of a bald spectator’s shiny bonce! The route was packed and, unfortunately, just as we all positioned our cameras, a TV camera arrived on the back of motorbike and parked right in front of us. I did get to see long jumper Greg Rutherford closer up, but didn’t get my camera out in time! Useless! I briefly met a longstanding Facebook friend and supporter, Paul Smith, whose tales of his Ron Hill inspired run streak (which now runs into the 2000s) entertain us on FB daily. He is chaperoning celebrity Olympic sprinter Iwan Thomas tomorrow and I think it’ll be a fast race for him! Unfortunately it was just too busy and there was too much going on for us to properly catch up. That’ll have to wait for another time. So, how do I feel? I have just over 12 hours before the start and I’m actually quite calm. I’ve eaten sensibly, cooking a meal in our little caravan which sits on the cliffs overlooking the North Sea. I made a Quorn, chickpea, potato and pea curry and served it with with Thai rice. Nothing too spicy, just very mild. We’re sitting here watching Strictly Come Dancing. I’m that relaxed! Tomorrow morning I plan to have toast and jam. I’ve bought Lucozade Sport Isotonic drink for the race, despite the fact that there will be Powerade available. I know that I’m ok with Lucozade so I’m sticking with it. One bottle should see me through. On top of that I have SIF gels to take at miles 4, 7 and 11 and Dextro tablets if I need them. Post-race I have soya milkshakes and a Mars Bar in my bag; I’m taking no chances! I’ll sign off now and check my kit bag for tomorrow. I just need to know that everything is there, my Garmin and iPhone are charged and that there is nothing left to do. Adios amigos! Well here we are. I have a few days left until the biggest race I’ll probably ever do. 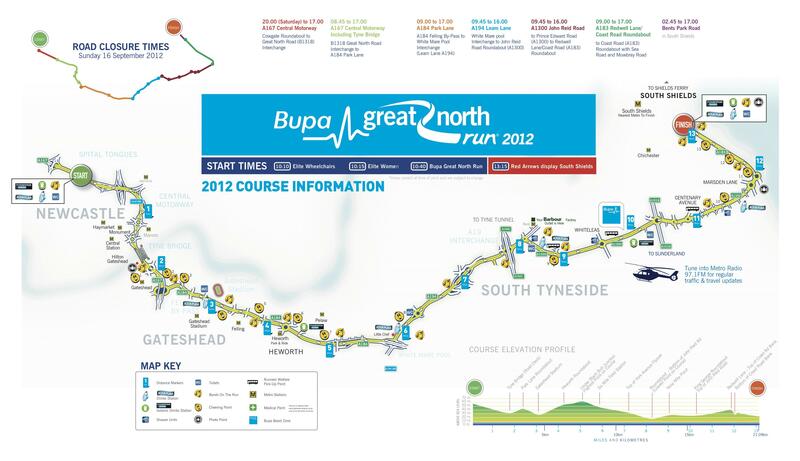 Depending on how it goes I might not do the Great North Run again. I don’t like all this worry leading up to the event, to be honest. I like small events, those without worries of where to park or which bus to get to get to the start! Ones where my husband can walk from the start to the finish without having to take a bus. So, I’ve destroyed my charity vest. It’s a shame, but the vest was just big enough and, I’m sure, would have chaffed and I’m not taking the chance. Instead I’ve cut the printed matter out and pinned it to the back of my chosen Nike vest. Here I Go Again – OK Go! Pump Up the Jam – D.O.N.S. Any suggestions for good pumping rock songs are welcomed! Today saw the my last long run before the impending doom/joy that is the Great North Run, doom or joy depending on which level of hysteria I am currently experiencing. However, long is a bit of a poor adjective for me to use as long, now, is upwards of 13 miles. This was a little, itty bitty 5 miles. Hardly enough for me to break into a sweat. I vaguely worked out that two and a bit laps of the castle would give me about 5 miles. 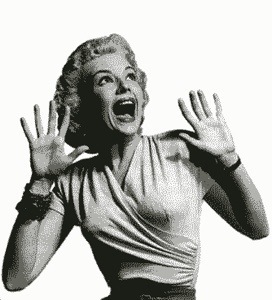 To my horror the battery on my Garmin was almost flat so I ran NAKED! Seeing a freckle where you were expecting to see your pace is a tad disconcerting at first, but you soon get used to it! I was determined to run an easy pace anyway so not having my watch to obsess about was probably a good thing. My ankle was a bit stiff, I must admit. Every now and again I would stop on walk breaks to stretch my legs out a bit. It did help and the discomfort, because it’s not pain, tended to come and go. Possibly running on uneven ground may have helped a bit, causing my foot to move more than running on the road would have. The ground was only really soggy up near the castle where the trees overhang the path, not really allowing the sun in. Murphy had a great time. I had a great time too, regardless of what I looked like at the end! I managed just over 11 min/mile pace which was what I wanted. Murphy was a total star, running perfectly on the lead when we got to the castle road, which has made me think really hard about entering some Canix events in the future. He wasn’t quite so chuffed when I plonked him in the sink on our return to wash his little belly! The hazards of being a slow-slung hound! So, that’s me. Two short runs left, one tomorrow I think and one on Thursday and then rest up until Sunday morning! We’re travelling across to the north east on Friday morning, camping at Whitley Bay. I’ve sussed out the Metro and we should be able to get to the start fairly easily, fingers crossed. We’ll test out the route on Saturday just to be sure. I’m really looking forward to meeting people I’ve only ever messaged on Facebook and Twitter. The only thing I have left to do is organise my gear. 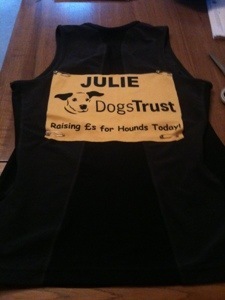 The Dogs Trust have sent me a personalised technical vest, but I’m not keen on wearing it. I think I’d rather wear something I’m comfortable in. What I’m considering doing is cutting the donated vest and pinning parts of it to my comfy vest. If that doesn’t work, I’ll just go incognito and enjoy the anonymity! Welcome to the Terrenus Help for Heroes blog. A long time in the making since, at the time of writing, we have completed 8 of our 9 events, but the next one is the main event, the biggie, the real cahuna, the challenge for a couple of middle aged guys who really should know better.